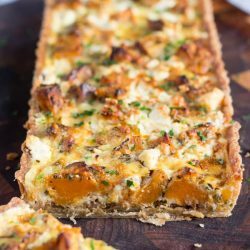 This deliciously savoury sweet potato, feta and caramelised onion tart makes the perfect vegetarian dish for an easy lunch or a light dinner. This simple tart is also ideal for entertaining, as it can readily be made ahead, and eaten either hot or cold. Preheat the oven to 200C (180C fan forced). Place the sweet potato in a large bowl and set aside. Roughly chop the garlic and then the rosemary. Mix the rosemary and garlic together on the chopping board, then continue mincing the herbs and garlic until they are both finely chopped. Scatter the rosemary mixture over the sweet potato. Drizzle over the olive oil, and season with salt & pepper. Toss everything together until the sweet potato cubes are well covered with oil. Spread evenly on a baking tray, and bake for 30 minutes or until the sweet potato is starting to brown and is just cooked. Roll out the pastry to fit your tart tin. Gently line the tin with the pastry. Bake the tart for 10 - 15 minutes, or until the edges of the tart turn a light, golden colour. Remove the weights and the baking paper. Reduce the oven to 180C (160C fan forced). Continue to bake for a further 10 minutes, or until the base of the tart has set and lightly brown. Remove the tart shell from the oven. Whisk the cream, milk, egg, egg yolk, and salt & pepper together in a jug. Set the oven to 190C (170C fan forced). Place the tart shell on a baking tray. Spread the caramelised onions in a thin layer over the base of the tart shell. Evenly distribute the sweet potato over the caramelised onions. Scatter the feta cheese over the sweet potato, allowing it to fall into the gaps between the sweet potato. Gently fill the tart shell 2/3 full of custard. Bake the tart for 10 minutes. Continue to bake for a further 10 minutes, or until the tart is golden and the middle is just set. Remove the tart from the oven, and allow to rest for 10 minutes before serving. I try to make the pastry and roast the sweet potato at least the day before I require them, which greatly reduces preparation time on baking day. I used a 12cm x 35cm tart tin with a removable base. If you have time, rest the unbaked tart tin in the fridge for 30 minutes to set the pastry. I don't always have time to do this, but do try to rest the pastry if the weather is hot. If you have any custard left over, make small tarts with leftover pastry scraps and any fillings you have in your fridge.